Nice scare headlines just to sell papers. Not once in the article does it mention what "high" means, how it was measured and the actual levels measured. No wonder the Star has rapidly turned into a rag newspaper not worth my time reading. And as usual, there is always a politician who acts like my late mother and always assumes the apocalypse will happen tomorrow if you aren't careful. Thanks Di Novo, you are a scaremongering tool. One has to wonder what 1+ hour each way per day in that coach does to a person. I have a feeling the problem is when the locomotive is pulling and the fumes /particulate travel over the cars. Probably not as much of a concern when the locomotive is pushing. I work at a transit garage and heres the truth. Any diesel vehicle sold after 2007 has whats called diesel particulate filters. Theyre very good at capturing 99% of the soot and other particulate matter. Whereas diesel engines especially ones built decades ago didnt have this technology. What the media has left out is that GO transit's newer locomotives emit little to no soot and particulate matter bulit by MPI industries. its the older GM locomotives numbered in the 500 series, you need to worry about. If they start eliminating everything that causes cancer all of the modern-day societies will be irreparably shut down indefinitely. It's the brake dust I worry about. Notice people coughing when the train slows down? That little tickle in your throat? what's 1000 times worse is the exhaust smells in Durham Transit busses. My gosh I dont know how people ride the busses on a regular basis because every time I get on one I get a headache for the fumes. it's freakin nasty. MG - stay closer to the front. But then again, I am on those buses for only a couple of stops. But being near the door does help. And I am at least thankful the Walking Ashtray hasn't been on it lately. "We’re already addressing all of the recommendations made in the report, which include installing improved air ventilation filters, using Tier 4 diesel locomotives with the highest emissions standards, and pursuing electrified service." GO has one tier 4 locomotive, 647, and it was a test locomotive that was deemed not worth pursuing. They have an order for 16 tier 4 locomotives, a different version than the 647 test, but they do not know, or won't say, when the order will be delivered. The UP Yours, sorry UP Express, supposedly have tier 4 engines but they carry very few passengers relative to GO trains. Given the rate at which Metrolinx completes Capital Projects who know when electrification will be finished. Given all that, remember it is only a problem in the first couple of coaches when the train is headed eastbound and the locomotive is pulling. 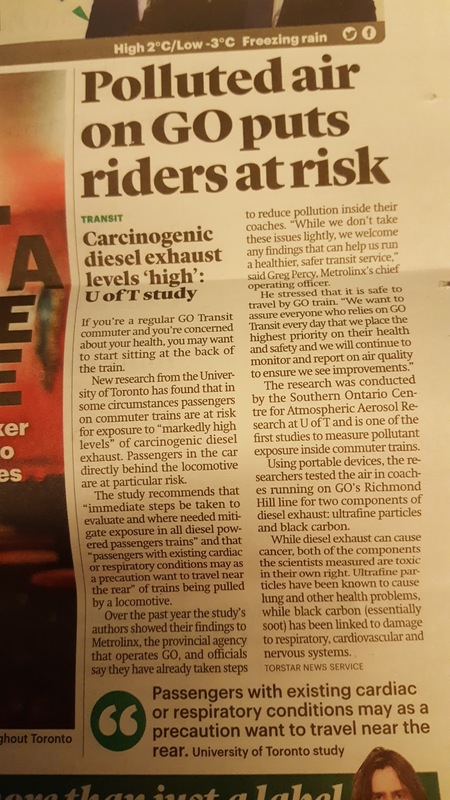 You would probably be subjected to a lot more carcinogens on a drive in on the 401 everyday, So if you have respiratory problems, don't sit in the first couple of cars behind the locomotive in pull mode. They supposedly are putting in a system that closes the air intakes in the coaches when the train is accelerating out of a station, so that should alleviate the worst of the problems. Here's the thing - diesel exhaust and suspended particulate matter has been shown in reseach to be not even comparable in persistence to cigarette smoke. Buttsucker exhaust comes with far more added chemicals and the process is far less efficient, and unfiltered. Irritants and allergenic and carcinogenic chemicals and particulates from tobacco smoke persist long after the heavier carbon from diesel exhaust settles out and the gases (mostly CO, dissipate. These researchers would do well to park their monitors by the doors and PRESTO dispensers outside, say, Oakville GO station - you know, the places where they have no smoking signs, and no evident enforcement. They'll get a lungful there.